Recently Quietus writer and musician Jimmy Martin was asked to be part of a new experiment looking at the our culture’s saturation in music. Here is his account of the strange and booze fuelled evening. In a darkened room, somewhere in Soho, 17 men and women are locked in a peculiar ritual. Standing en masse, they each intone a single note, facing a motionless master of ceremonies behind a laptop. The reverence and intensity mount, even as one or two of the assembled entourage clearly struggle to stay in tune, and still more of their number had trouble hitting the note in the first place. Yet musical exactitude and proficiency are some way from being the intention of The17, and no audience beyond those in this room will ever have the privilege of hearing such indiscretions. Such is the latest project of Bill Drummond: As we, his choir, stand boozily entranced and only slightly self-conscious, we might even believe that this wry iconoclast and lifelong racket obsessive is finding a new way to engage with his treasured, elusive fix in the realm of a fickle and fractious new century. 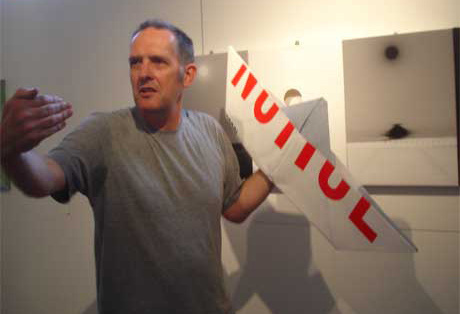 Most of those present know Bill Drummond either as a shadowy figure from the hit parade of the late eighties and early nineties, or else, of course, as the fella who subsequently burnt a million quid of the money he made therein. Yet attempt to list the illustrious catalogue of adventures this towering, charismatic figure has undertaken, and you’ll soon find yourself lost in a bewildering alternate reality of extravagant gestures and quasi-situationist pranks, crucially all shot through with both evangelical intensity and fearsome sincerity. Whether painstakingly contriving a Number One hit single with the help of a manifesto, an old Gary Glitter record and the Dr.Who theme, theatrically machine-gunning the front row of the Brit Awards whilst engaged in collaboration with Extreme Noise Terror, or accidentally helping to invent ambient house with the KLF’s Chill Out, all that Drummond has embarked on has seemed to part of a grander, overarching scheme. Within this, he’s seemingly gazed sideways at the very maws of pop culture through his own skewed paradigm, and simultaneously celebrated and ridiculed its inherent glory and its willful absurdity. What’s more, he’s showing no signs of wavering from this mission, if The17 is anything to go by. Even while our consumption and understanding of music changes faster than many of us can get a handle on, this 55-year-old bloke, as ever, is one step ahead of us. Prophecies of doom for recorded mediums of music are nothing new, certainly. Yet few - in fact, make that none - have suggested that the alternative lies in a return to the human voice and the devotional simplicity of the chorale. But this is where we come in. Thus, we loom forth, droning out a succession of pre-ordained notes " the pentatonic scale " basically all the ’black notes’ between C and C on a piano. The initial grace tones of insecurity and mild mirth fade into a strange kind of elation, partly buoyed by Drummond’s charismatically orated yarns of the joy of his first musical purchase (The Beatles’ ’Penny Lane' / 'Strawberry Fields Forever’, since you’re asking) and his quest to avoid the trap of blasé, seen-it-all cynicism that threatens amidst the advancing years, media saturation and accelerating cultures, All at once, us droners are adrift in a strange landscape that somehow seems to suggest both punk rock self-sufficiency and hippified performance-as-therapy at once. Yet somehow this experience is also neither, divorced from twentieth century archetype and rooted beyond the cacophonic symphony of hums, drones and rattles that Drummond first heard driving his Land Rover Northwards and which, so he claims, formed a vision of a return to a primal music beyond reference, knowledge and the entrapment of the ever-decreasing- circles of the post-modern malaise. Or is it? Not everyone’s convinced. “Bill Drummond and Jimmy Cauty are the Jeremy Beadles of pop music!” volleys forth one participant afterwards, sure he’s the subject of some level of cosmically-aligned wind-up. Another droner offers an angry enquiry as regards “pluralism”, which Drummond-quite understandably-entirely fails to understand. On the other hand, another of The17 praises its essentially selfish undertones, given this is, in effect, genuinely music made by and for the participants, without even the threat of the proverbial bonus anywhere in sight. You’d be on shaky ground to suggest that The17 manifesto is watertight, just as if you’d suggested that The Manual, Drummond’s supposedly failsafe 1988 guide to having a Number One Single, would actually bear fruit every time. Drummond himself admits that by even recording our off-key droning for the one listen we are permitted - before it’s erased forever - we’re essentially compromising the purity of the post-recorded-music vision. And, of course, when we hear the five notes The17 have recorded all at once, rather than a primal noise entirely free from cultural shackles, many of us are alas reminded, flattering ourselves, perhaps, of the choral dronescapes by Ligeti that Kubrick used to haunt the further reaches of 2001: A Space Odyssey. However, none of this has been the point. As we stumble into the London evening with the feeling of a job somehow well done, it’s clear that this curious shaman has been up to his old tricks again: And once again, Drummond, along with all his fervent rhetoric, philosophical backbone and whatever attendant tomfoolery has transpired, has once again helped to reassemble and re-appropriate cultural ingredients so often taken for granted into something fresh and life-affirming. And regardless of what death throes recorded music may encounter, or how many times the giddy spectacle of pop culture chases its own tail, things are never going to be boring so long as we keep an eye on this skewed visionary and wizard of the wayward.